Do you dream of being a franchise owner? Scope out this list of the most popular brands over the past decade -- and how well their owners have done at repaying startup loans backed by the Small Business Administration. 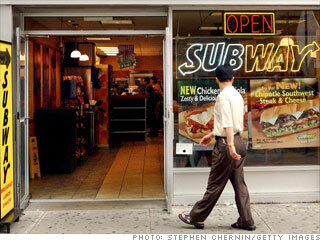 Home of the $5 footlong sub, Subway is the biggest fast-food chain in the world, with almost 33,000 outposts in 91 countries. The initial franchise fee startup is $15,000, a fairly low sum compared to other brands. With fewer than 8% of SBA-backed borrowers defaulting on their loans, Subway has a better track record than similar brands -- rival sub shop Blimpie has a 46% loan failure rate, and Quiznos is also well into the double digits. The combination of global branding, minimal upfront outlay of cash, and low loan default rates have made Subway the most popular brand in the last decade for entrepreneurs looking to open a franchise, according to the SBA's lending data. And Subway is hatching plans to extend its dominance outside the noontime hour: It recently launched into the breakfast arena, pitting itself against fast-food breakfast Goliath McDonald's. Source: Loan data is from the Small Business Administration, covering loans made from October 2000 through September 2009. The failure rate represents the number of loans in liquidation or charged off, divided by the number of loans disbursed.